A complete bastardisation of too many dishes to mention, but a happy delicious accident that incorporates the spicy savoury Sichuan street food of dandan noodles with the creaminess of laksa. Dry noodles seem to work better in this soup than fresh, which draw in too much sauce and become soggy. Add the garlic, ginger, laksa paste and peanut butter to a medium nonstick frying pan. Cook over medium heat until fragrant and the laksa paste starts to separate. Add the stock and coconut milk and simmer for 20 minutes. Evenly mix the beef mince with the soy sauce and sesame oil. Place a frying pan over medium heat and fry the beef until fragrant and thoroughly browned. Add the remaining ingredients except for the rice wine and cook for 1 to 2 minutes. Finally, add the rice wine to deglaze the pan; the meat should take on a shine. Set aside. Meanwhile, bring a pot of water to the boil and cook the noodles according to packet instructions. 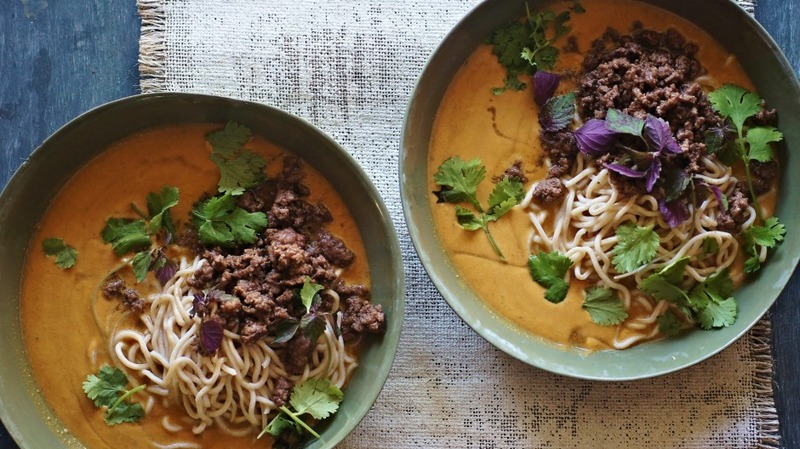 To serve, ladle the laksa soup into serving bowls. Add noodles and top generously with beef. Garnish with herbs, drizzle over chilli oil (if using) and serve immediately.